One of the benefits of having work done on your RV at Camping World (CW) is dry camping in the parking lot. I know some CW locations have very nice RV Camping sites while others, like New Braunfels, have basic hook ups in the very back. Since we arrived late, we just pulled into the front parking lot. We woke up on Thursday 11/1 and decided to drive down the street to Burger King for a quick breakfast. We could leave the fur babies in Cramalot-Inn since we now have a toad. When we got back I met with service department to get checked in. They disconnected the U-Haul and drove our home into a service bay. The trailer got parked in front of the service bay were our old Cedar Creek was parked. CW provided a couple of folks to help me dig out the couch/bed that was going back into that unit. I also dropped off our never used Blue Boy and the tripod that took the shake out of the fifth wheel. I no longer needed either of these nor did I want to mess with selling them on eBay. After repacking the trailer one more time, I was able to speak to the service tech who wold be working on our motor home. I verified the work that needed to be done and gave him our cell phone numbers should something come up. Carol, meanwhile was napping in the car with our fur babies. We had a day to kill. As we drove off, we decided to see if PetsMart could take Cody, MeiLing and Patches for day boarding. We felt it would be better on them if they had a place to hang out rather than be stuck in a car while did a little shopping. We needed to find a TV stand for our 37″ HDTV that would be mounted somewhere in our living room where a swivel recliner used to be. Target was in the same center as PetsMart so we stopped there. As we wondered about aimlessly, the store manager asked if we needed help. She was extremely helpful and found a few possible solutions that may work for us. We decided to continue our hunt. We were about 10 miles away from Tanager Outlet Mall so we decided to head there. It was cool shopping out there during the week because there were very few people milling about. It was getting close to lunch time and the BK breakfast was wearing off. We found a cool fifty’s style dinner, Johnny Rockets where we enjoyed a supper lunch. Then we headed next door to Starbucks to borrow their free WiFi and kill more time. Around 3PM we decided to head back to CW to check on the progress of the work that needed to be done. We meet with our salesman who gave us a box of stuff we forgot to move from 5th wheel. He checked with the service department and told us everything was ready. Now it was time for me to inspect the work. Horn works, new Microwave/Convection oven is in place, new backup camera and video monitor was operational, and passenger’s power visor worked. Looks like everything is done and we are ready to hit the road again after a stop at Buckee’s for fuel. While I did that, Carol headed to PetsMart to get the fur babies. Our strategy was to head north towards Austin, take the SH130 toll road around the east side of the city to US290. Then East on 290 to the Ledbetter, TX. 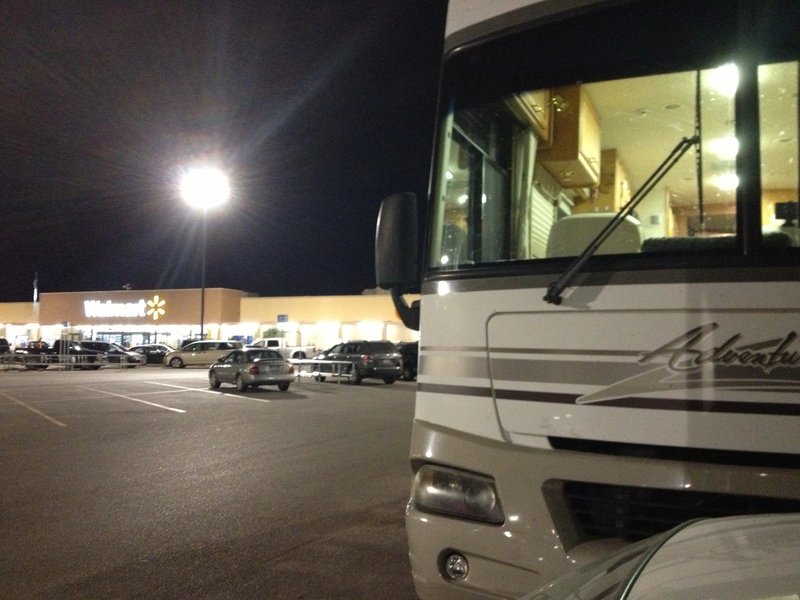 We arrived at the WalMart in Giddings and decided to stop for the night. If we were to continue to Carl Wendler’s ranch in Ledbetter, it would be country dark. (FYI – for you city folks, country dark is much darker than city dark.) We did not want to mess with unloading a trailer in the dark, especially country dark. So here we are at Camp WalMart, in Giddings. I walked across the parking lot to Subway for sandwiches. Finally another very long and busy day has come to an end. Friday 11/2 we will have a short drive to the ranch. This entry was posted in Texas and tagged Camping World, fur babies. Bookmark the permalink. Anxious to hear the continuing story! Sound like you have a super dupper for you and Carol. hope that you get some good service and many miles. I hope and pray you have better luck with your Class-A then we did with ours’. Our Class-A Holiday Rambler’s Cummins engine lasted approximately 300 miles after we bought it. The rig had only 35K miles on it to begin with so we thought, how can we go wrong with a Cummins diesel engine. Laugh is on us. Our extended warranty found a loop hole so that was worthless to us. “Xtra Ride” extended warranty. Don’t waste your time or money on it. Thank God “Nobel RV” of Rochester, MN stood by us and gave us our money back and then put us into a Class-C, Ford, “Four Winds.” It’s a 2012 with on 6K miles and the Ford Factory Warranty on the drive train. Thank you “Nobel RV.” God’s Blessings on you and enjoy your new Class-A.